By now, you would be familiar with DMAIC methodology and know when, where and how it is used and the benefits of it in problem solving and performance improvement. 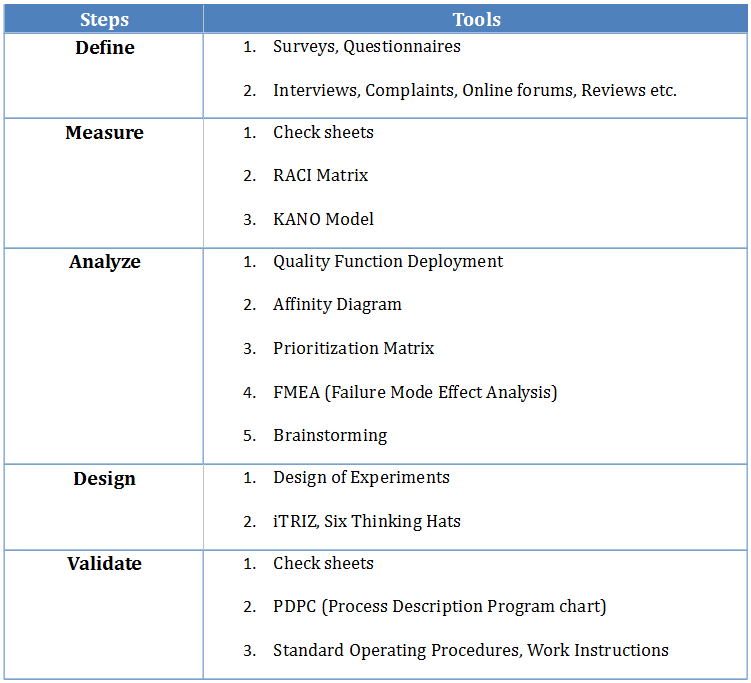 But DMAIC is not the only methodology that is used in Six Sigma. 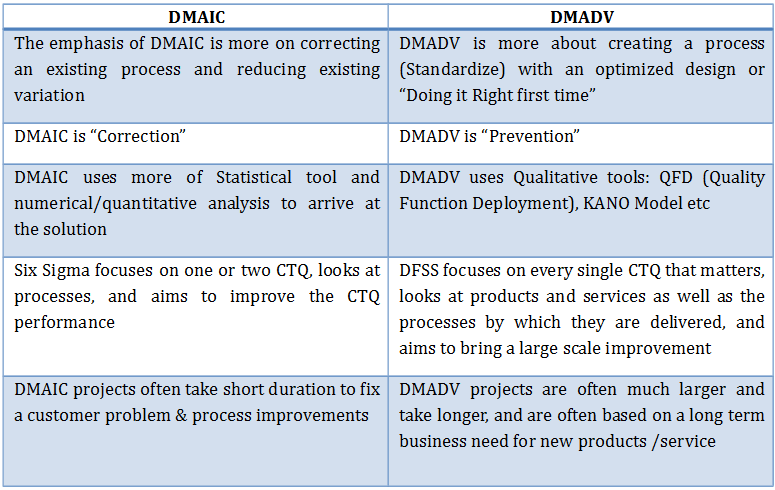 There is another common term DMADV which is equally important as DMAIC. To become a master in Six Sigma and use it for business purposes, it is essential to be familiar with all the other methodologies. For that, we need to first understand where, when and why we use DMADV. Table1: The Phases in DMADV and the activities in brief are described in the table. The steps DMA (expands as Define, Measure, Analyze) – are similar to DMAIC, (remember similar but not the same). 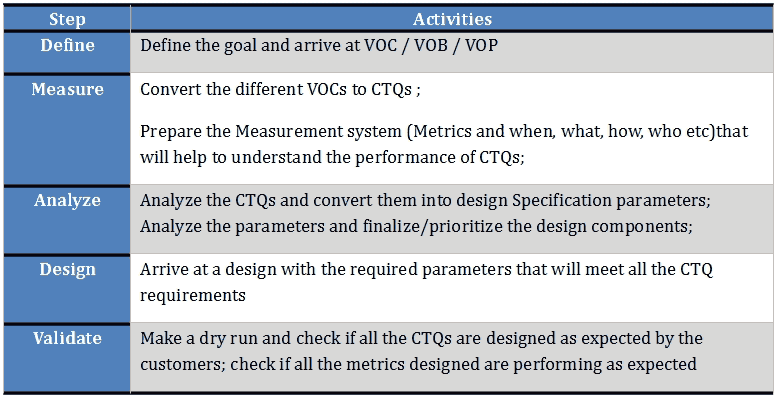 The activities in DEFINE (Define the problem, Set up the goal) – is evidently the same as DMAIC. But in Measure and Analyze, there is a slight difference in what you measure and what and how you analyze. Finally, D & V stand for Design and Validate/Verify, respectively, clearly indicating that a Process Design is undertaken to meet Six Sigma levels of Performance. Hence, DMADV is alternatively also called as DFSS (Design for Six Sigma). 1. When should we use DMADV? 2. What is the difference between DMAIC and DMADV? 3. Does DMADV use the same tools like DMAIC? DMAIC is used, when the problem you want to solve is for a process that is already existing but not meeting the expected levels of performance. DMAIC is used when you want to correct an existing process that has not been performing up to the expectations. Alternatively, DMADV is used when you want to set up/design a whole new process, that should be meeting the desired level of performance from the beginning. DMADV may also be used when there is a need to redesign an existing product or process, rather than constantly correcting the process. The soul of DMADV is in understanding the customer’s requirements and the CTQs which are mostly expressed qualitatively. 1. What are all the areas the Customer service improvement team will cover? 2. What would be the TAT (Turn-around time) that the team can fix up to respond to its customers? 3. What would be the working hours (window) required to maintain the TAT? 4. What skills are required by the team members processing the complaints? 5. How many staff is required to be present in each interval/day/time/shift? The same service provider may take up DMAIC approach, when the already existing customer service team’s TAT Target fixed is 3 hours but majority of the complaints are resolved in 6-7 hours. The solution to the DMAIC project taken could be a change in one or more of the five points discussed above. What is the difference between DMAIC & DMADV? DMADV and DMAIC are two tools adopted for same mission/vision: Achieve Six Sigma Performance; Two different approaches and methodology used to attain a single goal under different circumstances and problem areas. But the objective of both DMADV and DMAIC is the same: a) Variation reduction and b) Adherence to customer’s requirements. Another important point to be remembered when using the DMADV approach is the effect of failure of design on the entire process. In DMAIC, when one of the solutions adopted does not prove to improve the result, there is always an alternative of returning to the AS-IS process; But in DMADV, since the process is quite new, there will not be any alternatives and the entire design should be revised and the failure might impact the cost and delay the project/forthcoming processes. Therefore care should be taken in designing the new process to the required accuracy. Let us look at each step in detail with a case study in the forthcoming sections.